お子様からご高齢の方まで、日本語も使いながらレッスンしたいという方も、英語のみのレッスンをご希望の方も大歓迎です。<> 私は、日本の大学で経済学を勉強した後、カナダに2年半住み、大学院で環境学修士を取得しました。バンクーバー（3週間）デンバー（１ヶ月）サンディエゴ（５週間）などの短期留学の経験もあります。 大学院卒業後は、国際NGOで国際プロジェクトマネージャーとして８年間勤務し、多くの英語話者と共に働いてきました。世界各国での国際会議への参加経験も豊富です。 英語を教えた経験は約６年です。息子がおり子どもは大好きです。 趣味は楽器演奏（クラリネット、フルート、ウクレレ）ドラマや映画鑑賞、美味しいお茶を飲むこと、旅行です。18カ国ほど行ったことがあります。 初級〜中級の方、旅行先でスムーズに英語が話せるようになりたい、受験や留学に備えて英語力を磨きたい、仕事で英語を使いたい方など、どうぞレッスンにいらしてください。一緒に英語を楽しみましょう！ TOEIC935 TOEFL 600 英検準一級　小学校英語準認定指導者資格保有　(J-SHINE) Hello. I am Nana. I lived in Canada for 2 and half years and have a master degree in Environmental Studies. I was an international project manager at an international NGO for 8 years and worked with many English-speaking people. I have many experiences to attend international conferences all over the world. I have experiences to teach English for about 6year. I am a mother of a son, so I am great with Kids. Let's learn English together! 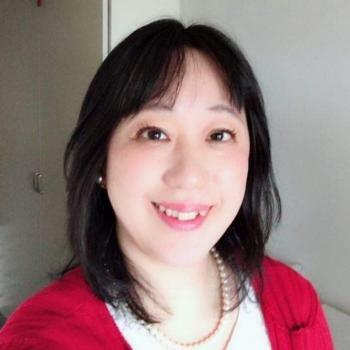 Teacher Nana can teach students of all ages using her experiences of staying in Canada for 2 years, working as an international project manager, and raising a son.She likes to talk about trip since she has visited about 18 countries. She is a good listener, and she has enthusiasm in teaching English. She’ll best suited for beginners and intermediate level students. Her smile makes students happy. It was nice meeting you! I felt so comfortable talking with you. Loved it. Have a great day!